The life journeys of Shamiran Sarhadi and her son Jonathan Sarhadi have been very different, yet they will intersect May 24 in a very special moment. That’s when Shamiran will walk the stage to receive her Executive MBA, with honors, within minutes of Jonathan receiving his MBA, also with honors. Despite the many nights they worked together on assignments and projects, the only goal was for both of them to graduate. Graduating at the same time was something they both realized was possible only a few months ago. Shamiran was born and raised in Tehran, Iran, and moved to the U.S. when she was 18. 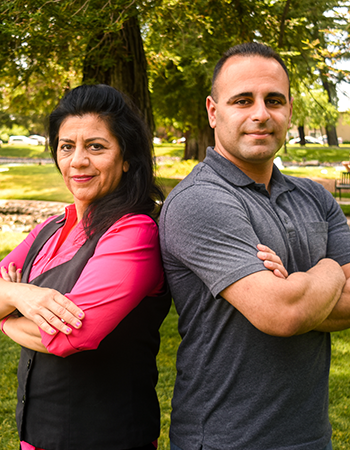 She took basic English courses at Modesto Junior College, then entered Stanislaus State, earning her bachelor’s degree in computer information systems. Jonathan, a Pitman High graduate, earned his bachelor’s degree in psychology in 2014 with a minor in business administration. He works in the Academic Senate office at Stan State and said he was inspired at an early age to eventually pursue an advanced degree. Since discovering they would be graduating in the same ceremony, they’ve had time to ponder what that moment will mean, personally and for the entire Sarhadi family. What can you tell us about your student and life experiences at Stan State that could serve as an inspiration to current and future students? How do you plan to use your Stan State degree to advance and/or improve life in our region? “I can apply my advanced MBA degree to leverage opportunities within the business world. I will utilize the skills and creativity I’ve developed through my MBA program to contribute innovative solutions to local/regional businesses.